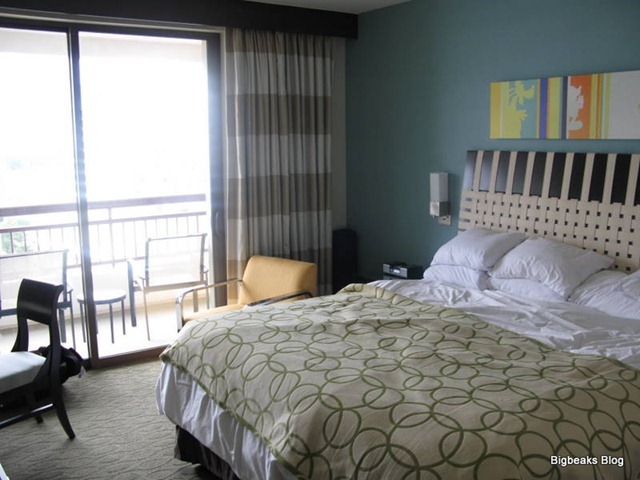 During our visit to Walt Disney World the first week of January, we stayed at the newest hotel on property, Bay Lake Tower at Disney’s Contemporary Resort. 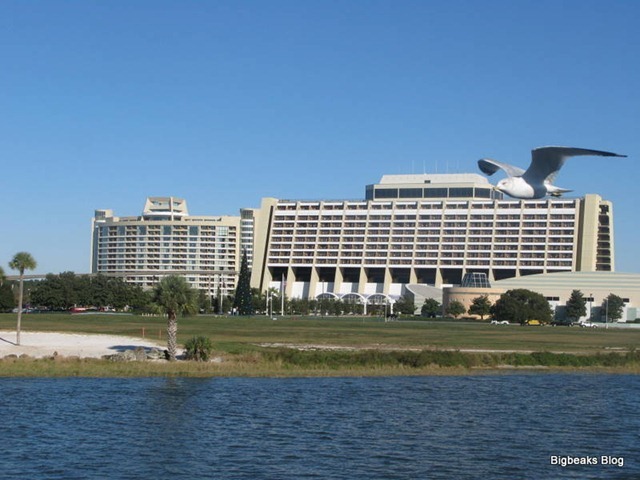 Bay Lake Tower is the recently-opened 15-story Disney Vacation Club tower located adjacent to the Contemporary on the site where the north garden wing used to be located. 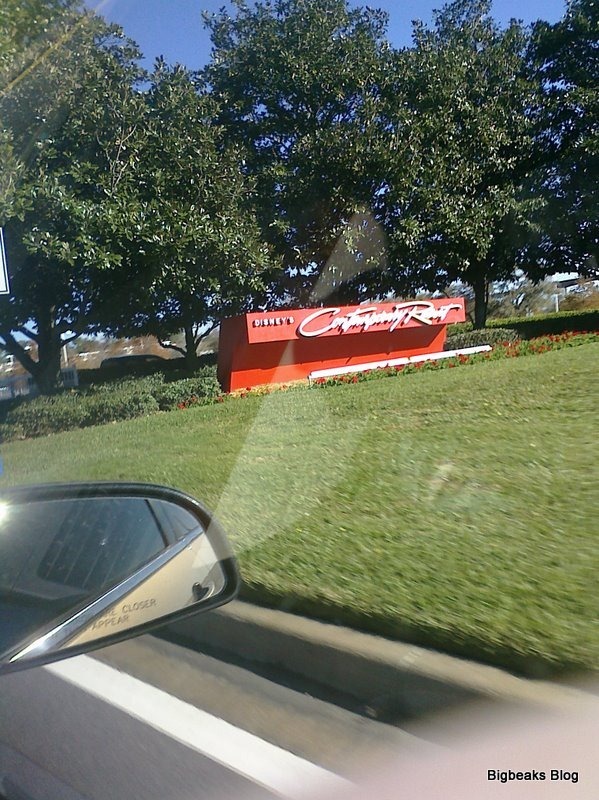 The Contemporary, of course, was one of the two original Disney World hotels (along with The Polynesian) and is the closest to the Magic Kingdom. 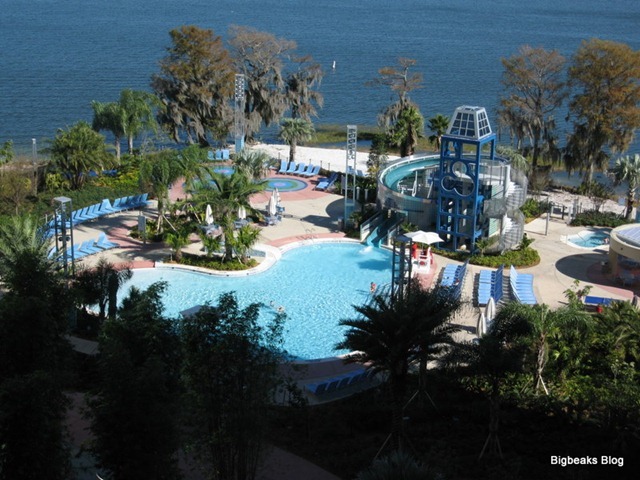 We have been Disney’s Vacation Club members for a few years, having previously purchased points with Disney’s Saratoga Springs as our home resort. We had always been a bit reticent about that resort due to its size and location and didn’t actually stay there for any length of time until 2008. For most of that trip, all of the alternative DVC resorts had sold out by the time the home resort exclusivity window was over. We really weren’t very happy with it, since it was so far away from all the parks while also being so large and spread out that we found it difficult to navigate around or to use many of the resort’s amenities. 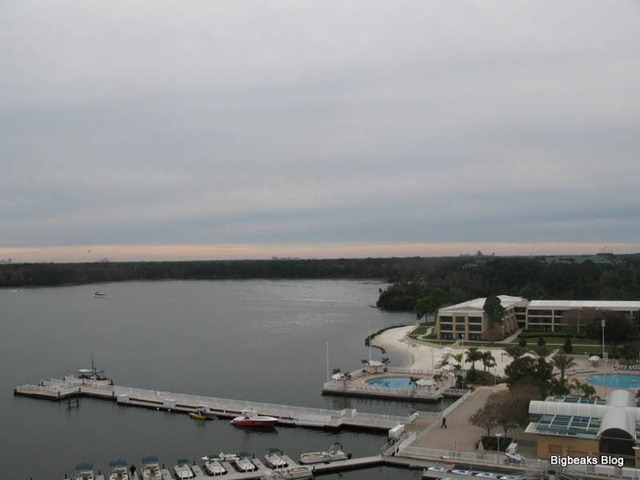 After that experience, we sold off our interest in the early part of 2009 and then re-purchased with Bay Lake Tower as our home resort. While we were taking a little bit of a risk by re-purchasing at a brand new DVC resort, we felt it was a very small risk. 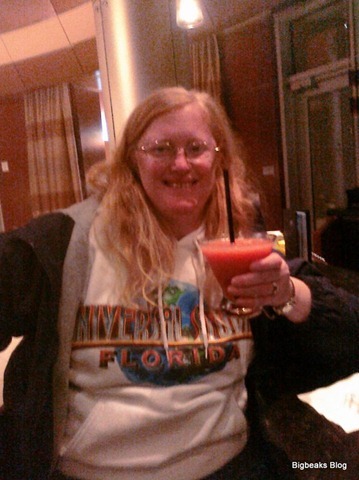 We had actually stayed at the Contemporary once before during our last trip before we bought into DVC. 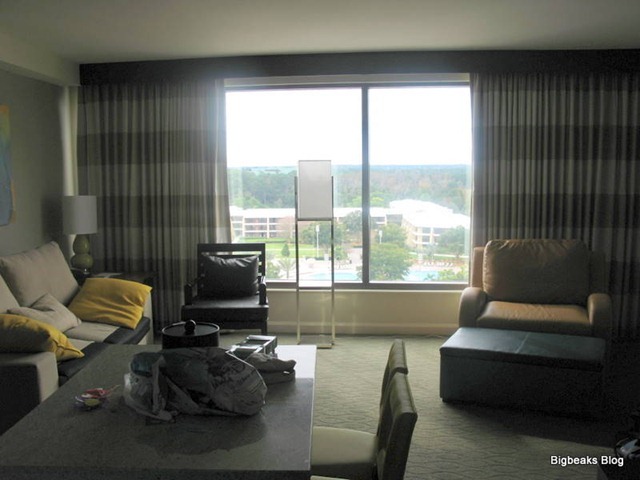 On that trip, we had stayed in a room in the old north garden wing, which was since demolished to make way for Bay Lake Tower. 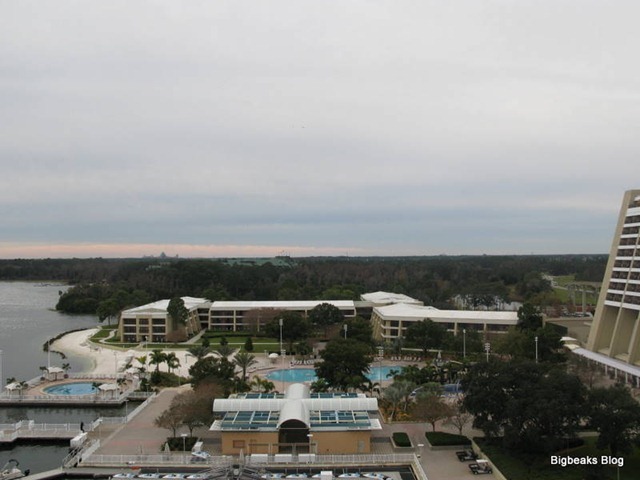 We knew from that experience that we liked both the location and the overall amenities of the Contemporary and that the specific location of the new DVC tower worked really well for us as well. 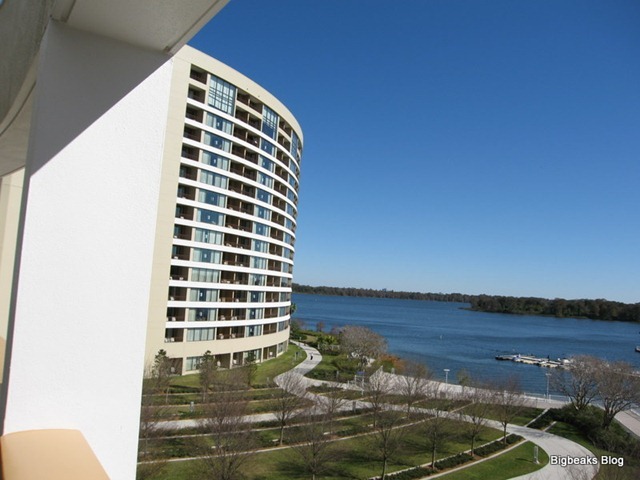 Bay Lake Tower is considered to be a part of the Contemporary Resort and generally shares amenities. Check-in and other guests services are done at the main desks in the Contemporary lobby. 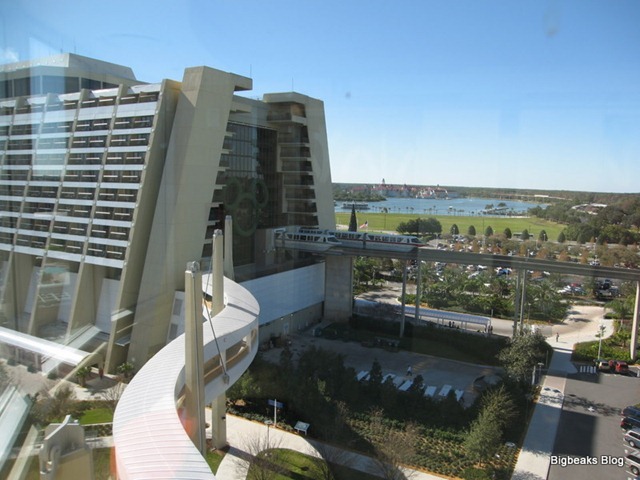 Access to the tower is available via a couple ground floor entrances or by way of a skybridge that connects the 4th floor of the Contemporary with the 5th floor of Bay Lake Tower. The bridge is not fully enclosed and, therefore, exposed to the elements. If the weather indicates, it is definitely important to remember to grab coats or rain gear when crossing between the two buildings. 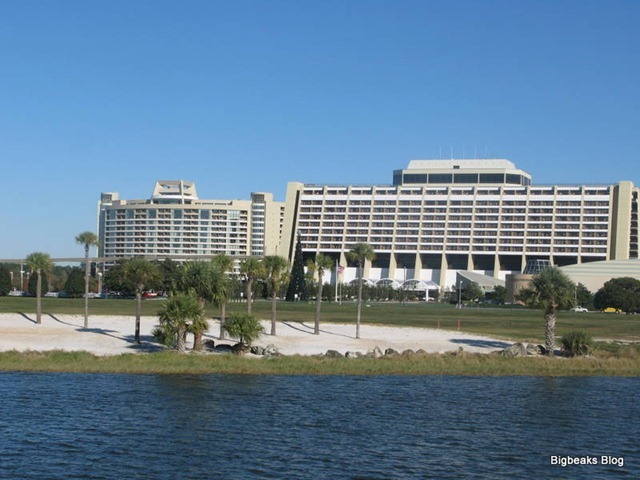 They do maintain a certain amount of exclusivity by always requiring the use of a room key to access any of the Bay Lake Tower entrances. This isn’t strictly enforced as it is extremely easy to simply follow other guests into the building, but I do think this is a generally good policy to discourage non guests from wandering the building. There are some pretty impressive views from the elevator lobbies and hall windows in the tower and I could easily see crowding and noise levels becoming a problem without the more restrictive access. The 4th floor of the Contemporary (where the skybridge is located) is the hotel’s famous “Grand Canyon Concourse” which includes the monorail station as well as various gift shops, restaurants, and a video arcade. The gift shops include two general Disney merchandise stores, Bayview Gifts which was mostly clothing and the Fantasia Shop, which featured a lot of Disney-branded toys, trinkets, and a pin shop. Near the skybridge is an additional shop called Concourse Sundries and Spirits, which has some grocery items. This store had a small selection of DVC-branded clothing and other items, including one Bay Lake Tower t-shirt, but I didn’t much like the design on it. We were disappointed that none of the shops had anything else in the way of merchandise specific to the Contemporary or Bay Lake Tower. The two restaurants on the 4th floor included Chef Mickey’s, which is a character buffet, and the quick service Contempo Cafe. 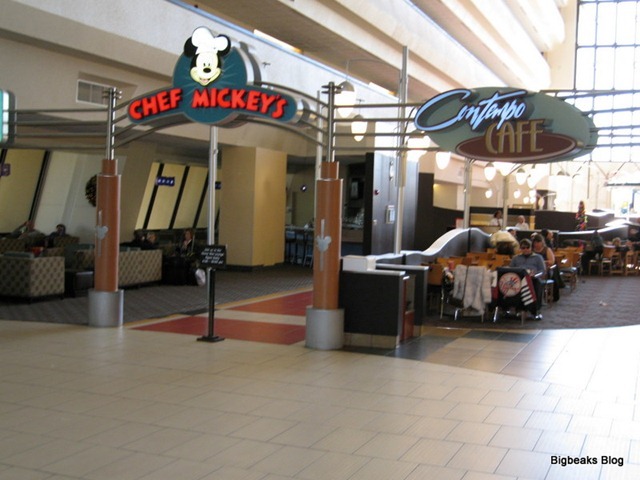 We had a nice breakfast at Chef Mickey’s on our day of arrival and had a couple quick service meals at Contempo Cafe at various times during our trip. Both were nice locations and we particularly appreciated having the quick service location that was so conveniently located. The Contempo Cafe is fairly new (it is in the former location of the old Concourse Steakhouse) and has a very modern feel to it, including a touchscreen ordering system. The Contemporary has two more restaurants that we didn’t visit, which are The Wave down on the first floor (in the location of the old fast food location) and the high-end California Grill on the top floor. 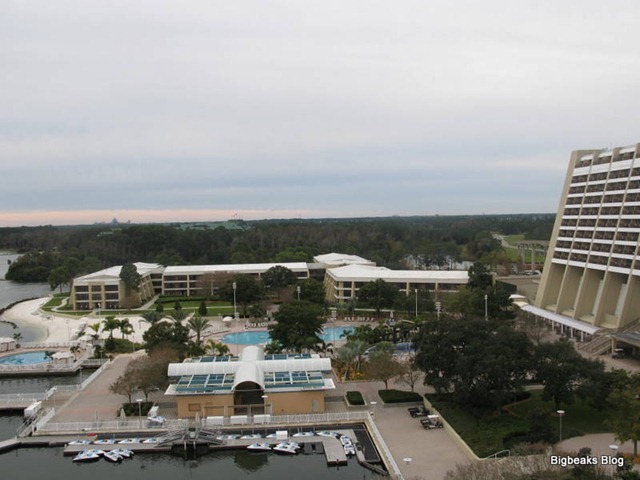 The top floor of Bay Lake Tower features a lounge that is exclusively available to DVC members staying at the resort on points. In order to access it, you have to present your key card at a check-in desk on the first floor and an attendant then escorts you to the elevator and unlocks access to that floor. The lounge includes a good-sized observation deck with an excellent view of the Magic Kingdom (obviously an excellent location for fireworks viewing) and an indoor area with a full bar, several tables, and a television. 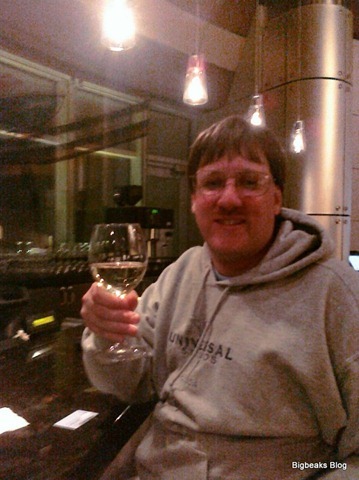 My wife and I visited up there to get a couple drinks after a dinner out together while my parents babysat our son. We didn’t get up there in time to see the fireworks, but did enjoy taking a few minutes to stand on the patio and look at the Magic Kingdom. I unfortunately didn’t get pictures of the lounge (other than the photos of us with our drinks) since we had planned to make a later return visit, but never got around to it, mainly because we hadn’t realized that it didn’t open until 5pm. The Contemporary has a couple swimming pools and a variety of outdoor recreation activities, including various boat rentals. 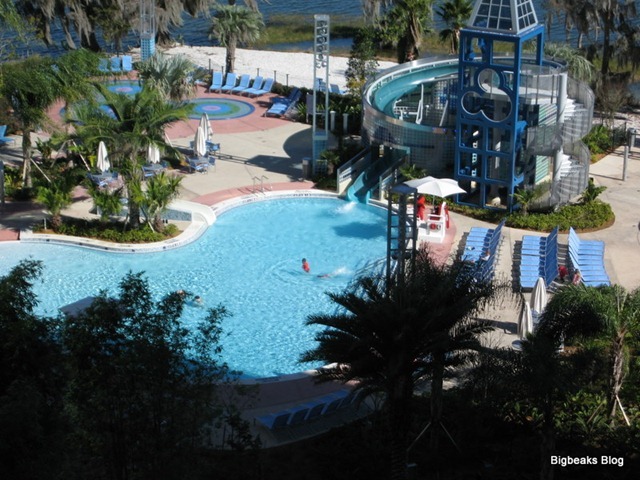 There is also a pretty nice looking swimming pool (with a waterslide) that is specifically for the Bay Lake Tower guests. Unfortunately, we never made use of any of them because our trip was during a record-setting cold spell for that part of Florida. During pretty much the entire length of our stay, the temperatures were generally in the 30s or 40s, meaning that these features are saved for a future visit. 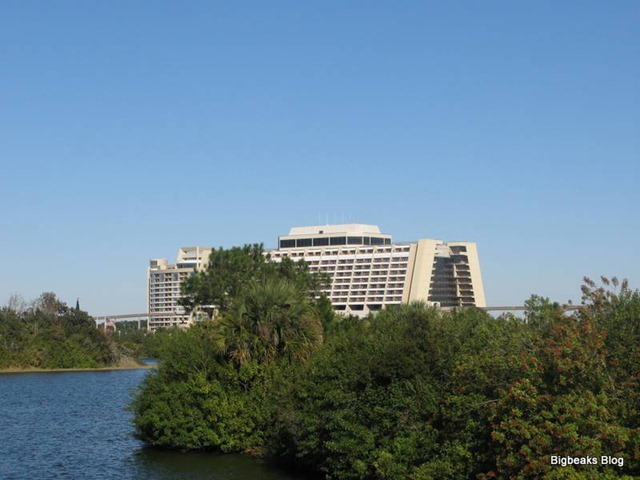 The location of the Contemporary Resort is definitely one of its strongest features, with especially easy access to the Magic Kingdom and Epcot. The Magic Kingdom is so close that it is a pretty quick walk to get there. On evening, we watched the fireworks show from the bridge between Main Street and Tomorrowland and were able to walk back to the hotel and get seated at a table in the Contempo Cafe within about 20 minutes after the show ended! While you can also take the monorail to and from the Magic Kingdom, that will generally take longer than walking and probably isn’t worth the trouble in most cases. Epcot is a pretty easy monorail ride from the Contemporary. You first take the resort monorail one stop up to the Transportation & Ticket Center and then transfer to the Epcot monorail. The whole trip typically takes about 1/2 hour or so, but it is a very pleasant and generally easy one. Bus transportation is provided to the other two parks and to Downtown Disney and the trips can be a bit time consuming. In most cases those buses also stop at either the Polynesian, The Grand Floridian, or both on the way to the parks, although the Contemporary always seems to be the first stop coming back. Finally, boat transportation is available to the Wilderness Lodge and Fort Wilderness. 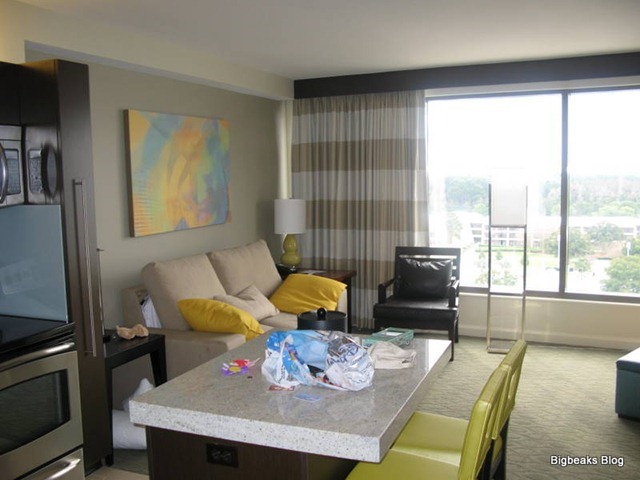 As a family of 3, we book 1-bedroom villas at a DVC resort. This gives us plenty of room and allows my wife and I to sleep in a separate room from our 6-year-old son, an arrangement which generally results in all of us sleeping better than we do at hotels where we all share a single room. The 1-bedroom villas all have a pull-out sofabed, which gives our son a comfortable place to sleep. We noticed that the living room chair also converted into a bed, which would probably be very nice for families with more than one child. 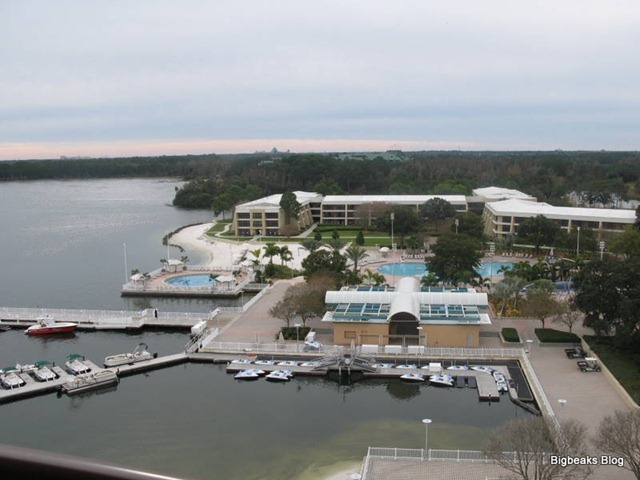 Our room was on the 10th floor of the building and featured a Bay Lake view. Lake view rooms are a bit less expensive than those with a Magic Kingdom view, but we came to the conclusion that we probably had the better view. The tower is positioned in such a way that rooms that look over the Magic Kingdom will generally have a whole bunch of parking lot in the foreground. At least from our room, though, the lake view was a beautiful, pretty much unspoiled scenic view. We could, of course, see the lake and the various watercraft from the room. We also had good views of the main Contemporary tower and the south garden wing and the main pool and marina areas. A little further off, we had good views of both the Grand Floridian Resort and the Wilderness Lodge. Finally, off in the distance, we could see the tallest landmarks at Epcot (Spaceship Earth), Disney’s Hollywood Studios (Tower of Terror), and Disney’s Animal Kingdom (Expedition Everest and the Tree of Life). We thought it was interesting that we didn’t have a Magic Kingdom view, but could actually see all three of the other parks. One obvious advantage of the Magic Kingdom view rooms would be that you could likely watch their fireworks show from your room. While this wasn’t available to us from our room, we did discover early on that we had a couple opportunities to watch the Electric Water Pageant (a long-running water show that was a precursor to the Main Street Electrical Parade) from our room every night. I didn’t see it first hand, but my parents mentioned watching Epcot’s Illuminations from the room on an evening when they were babysitting our son while my wife and I had a dinner out on our own. The room had the typical amenities that we have come to expect at a DVC resort. We especially appreciate the in-room washer and dryer, which allows us to do laundry every couple days and, thus, pack lighter than we typically would. We can easily do one or two loads of laundry after we get back from the parks in an evening, letting the dryer run overnight. This prevents laundry from taking any time away from our vacation activities like it typically would if we needed to use coin-operated machines. 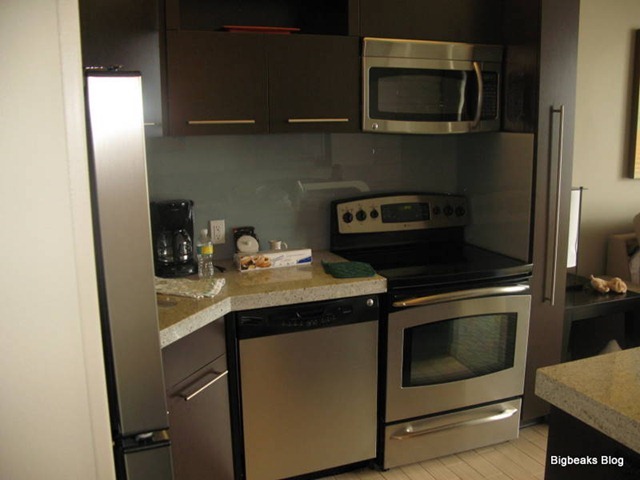 The DVC rooms also have full-sized kitchens, which is nice, although we honestly don’t use it all that much since we tend to prefer to eat most of our meals out during our vacations. We do usually pick up some breakfast foods, though, so it is nice having readily available dishes and silverware for that. The full-sized refrigerator is also very nice to have. I don’t think we have ever actually used the oven or stove during one of our DVC stays, though. The 1-bedroom villas at the older DVC resorts always had enormous bathrooms, split into multiple rooms for the whirlpool bathtub, sink and shower, and toilet. The bathrooms at Bay Lake Tower are a more normal size, but for an extremely good reason. Unlike the older DVC resorts, the 1-bedroom villas have two full bathrooms instead of just one. The smaller bathroom is accessed from the main living room area (in our room, the door was right next to the main entrance) and has a toilet, sink, and a shower/tub combination. The larger bathroom is accessed from the bedroom and includes a whirlpool tub and sink in an outer room and the toilet and good-sized walk-in shower in a secondary room. The extra bathroom was extremely nice to have and could be a major factor for us in choosing between Bay Lake Tower and other resorts on future visits. As usual, the whirlpool tub was once again one of our favorite features of the DVC rooms. It can be extremely relaxing after a long day of walking through the theme parks. 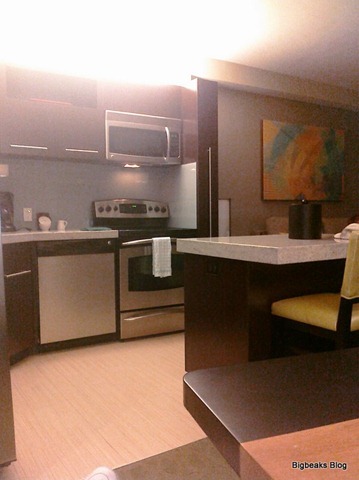 One mixed aspect to our experience at Bay Lake Tower was with the housekeeping staff. When we first checked in at around 10am, we were pretty surprised when the desk clerk told us that the room was available immediately. We headed up there (rather excitedly, I will admit) but were quickly disappointed when we entered the room and found it to look like something of a disaster area. The room clearly hadn’t been cleaned at all and the previous guests had left it in pretty poor condition. I called the housekeeping department and was told that they were going to put a “rush” order in for the room to be cleaned. I mentioned that we had breakfast reservations at Chef Mickey’s and the person on the phone told me to check back after we finished eating and the room should be clean. When we returned, we found the room to be unchanged from before. I called again and told the story and was told that a manager would either call or come up. We then waited about 20 minutes before we heard from someone who simply reminded us that the check-in time was 4pm and that the room would be cleaned by then. We didn’t get back again until around 10pm and the room was clean at that point. To be clear, I knew from the beginning that the check-in time was 4pm and we arrived with the expectation that we would need to store our luggage with Bell Services and retrieve it after we got back from the parks in the evening. I also recognize that mistakes happen and wouldn’t have been bothered if my first phone call to housekeeping had resulted in a simple apology and promise that the room would be clean by 4. What I objected to was being promised a “rush” cleaning before we got back from breakfast (something I hadn’t even asked for) and then having them fail to follow through on it. We lost at least 1/2 hour of park time that afternoon because of our extra return visit to the room and the extended wait for a manager, which I felt was necessary since I needed some authoritative assurance that the room wouldn’t still be a mess when we got back fairly late in the evening. Our experience with the housekeeping continued to be a bit mixed even after that. While the room was definitely cleaned, we did find it to be a bit less thorough than it should have been. In particular, I found the dining table and some of the other kitchen surfaces to still be a bit sticky feeling and ended up running a wet sponge over them a bit more myself. Another oddity was that we actually found the room to have been cleaned a few times when it wasn’t supposed to be. When DVC members are staying on points, the policy is that the room is cleaned on arrival and then every 8th day after that. We were only staying for 7 nights, so there shouldn’t have been any cleanings during our visit. 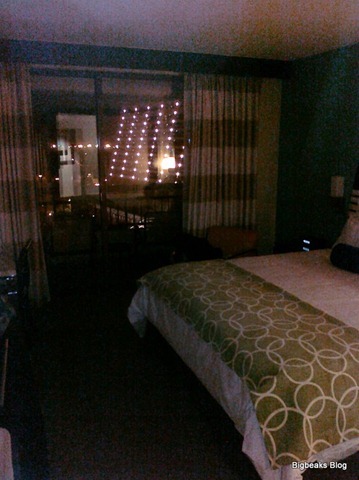 Instead, we came back and found that the room had clearly been cleaned (beds were made, towels replaced, etc.) several times during the trip. We weren’t charged for the extra cleanings and I guess I can’t complain too much about getting more than we were entitled, but it still seemed to suggest some lack of organization and communication within the housekeeping department. My opinion about the overall decor of the room was a bit mixed. The room was nice, but I found the fairly modernistic design to be a bit cold. Our favorite Walt Disney World resort (and DVC villas) has long been the Wilderness Lodge and I can definitely say that the more rustic decor there is much more to my liking. While I do think the Bay Lake Tower has some pretty large advantages when it comes to location and amenities, I also suspect we will still continue to book occasional stays at Wilderness Lodge for its decor. We made one visit over there for dinner at Whispering Canyon and my wife and I both commented as we walked into the lobby that it kind of felt like we were going home. Orlando and Disney World Trip Jan 2010 – Part 1: On Our Way!